I’ve enjoyed the freedom of being able to work from home and pursue my passions. Creating a blog is a great long-term strategy for financial independence, but in the short-term, you’ll need to find something that can generate real income to support your efforts. A passion for a topic or industry. The ability to post on sites, like Pinterest, whenever you find (or create) something of interest to your target audience. A significant time-commitment, especially up-front, to curating a ton of content that other people will find valuable, and worthy of sharing. A strategy for monetizing the information that you share with your followers. Don’t let the time commitment scare you off. Making money on Pinterest is a matter of translating what you already enjoy about the platform, into a targeted flow of information. Trust me, you’re already doing most of the “work” involved in generating money from Pinterest – you just haven’t optimized it yet for generating an income. This guide will walk you through the steps for creating a new income stream from one of the most popular social media platforms in the world. No degree in rocket science required. What does it take to become a Pinterest Consultant / Freelancer? How do I know what to charge for Pinterest consulting? 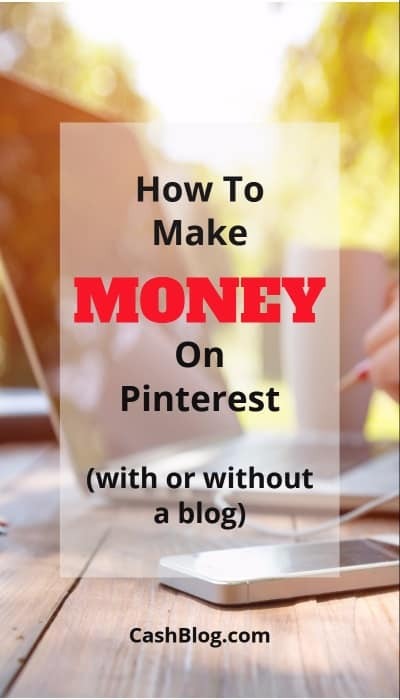 I promise, you can make money on Pinterest too! If you’re going to create and curate content for other Pinterest users, you need to understand how you use the platform. Turn your habits into a private case-study. What kind of content did I engage with? What about that content grabbed my attention and inspired me to tap on it? Did I follow any external links as a result of viewing interesting content? What persuaded me to “click”? Are there patterns or trends to the items I find most interesting and engaging? To better assess the things that spoke to me, I save the pins that inspired me. Personally, I love a good laugh – even if it’s a little slapstick. I only realized this after scrolling through my saved pins. Over time, you’ll create a collection of powerful posts. Along with your daily journal, you’ll have a firm foundation to start building a collection of content. It’s important that you start by targeting an audience that reflects who you are. Learning the ropes of Pinterest is a lot easier when you can gather almost unlimited information on your target audience. Over time, this will create a “look-a-like” tribe. You’ll be surprised at how effective you can become at marketing to people just like you. While you’re discovering your own Pinterest personality and finding ways to appeal to your future tribe, making immediate money is key. Otherwise you’ll have to start focusing on other things to support yourself financially – and that’s not the goal! 150 million monthly active users on Pinterest. 80 million Pinterest users outside of the United States. 75% of Pinterest users are engaging with the platform from a mobile device. 67% of Pinterest’s users are under 40 years old. The male population on Pinterest has grown by 120% year-over-year. 87% of Pinterest users have purchased a product based on a Pin that they loved. 72% of Pinterest users report using Pinterest to decide what to buy at a retailer. 83% of Pinterest users would prefer to follow a brand or celebrity. 5% of referral traffic to websites originates from Pinterest. Referrals from Promoted Pins spend 7x more than regular Pins. 70% of sales generated by Promoted Pins are from new customers. Holy stats batman! That’s a lot of data. Let me bottom-line it for you. Companies are generating significant sales by investing in Pinterest. And, the good news for you, is that they would rather keep their in-house employees focused on driving their core business. Pinterest and other social media marketing has become the domain of freelance experts and outside consultants. You can cash-in on the social media goldrush by becoming a consultant. This requires a little marketing, but the multitude of freelancing platforms make it easier than ever to connect with companies that need your help. 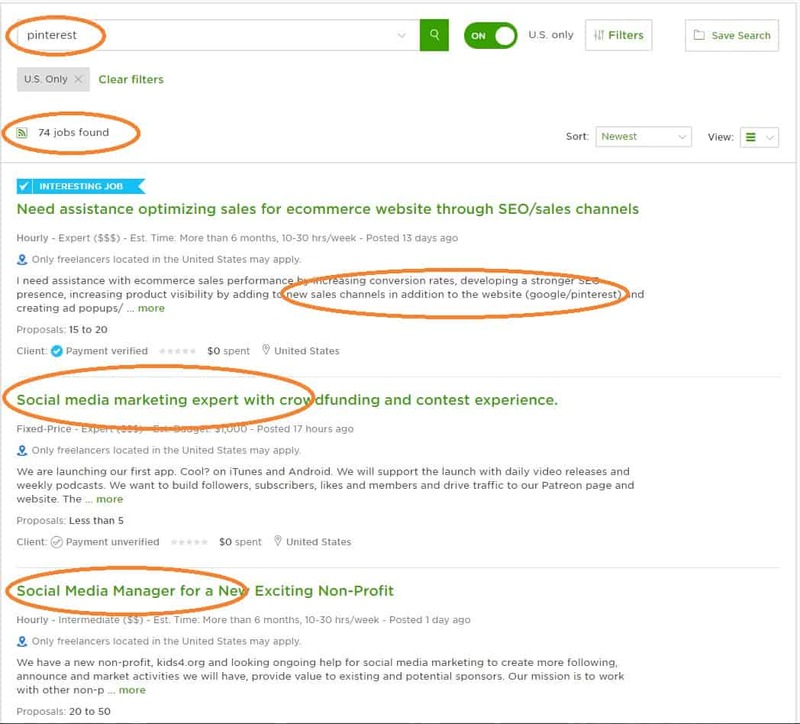 Take a look at this quick search I did using UpWork – a platform I’ve used to connect with business that need my help. As you start to get your feet wet, I would expect to take on some really low-paying work. Earning $5-$10 per hour is totally fine for a few weeks. The real payment comes in the form of client feedback. Every freelancing platform displays the experience of your past clients. This is used by new clients to decide if you’re a good fit for their team – before they even invite you to apply. Glowing client feedback is the most important thing you can earn in your first few weeks as a freelance Pinterest consultant. Deliver what you promise, on-time and with a great attitude. Overdeliver whenever possible – but don’t kill yourself. Clients will appreciate even one or two extra posts – and you can draw their attention to it by mentioning how much you enjoyed creating content about their industry. Provide a few tips or friendly suggestions whenever you see an opportunity to improve their online image. A fresh set of eyes, offered in a friendly way, can increase your value to your client. Provide glowing feedback for their client profile. Bashing a past client is a great way to scare off new ones. As you establish yourself, you’ll find that some clients will hire you on an ongoing basis. This is the reward you get for delivering an exceptional experience. Because you underbid in the beginning, in order to establish yourself, there will come a time when you need to raise the rates you charge for managing their Pinterest account. You’re running out of hours – making it difficult or impossible to take on new clients. Even though you’re working harder than ever, it’s difficult to make ends meet. Ideally, you should earn at least $30/hr for providing a quality Pinterest management service. To find out if you’re earning enough to live on, use Toggl to track your time. It’s free for individual users, and the insights it provides are powerful. I personally realized I was undercharging after looking at an entire week’s worth of time logs. And sometimes, I realize that I may be overcharging for certain tasks, even though it felt like I was putting in more hours than I really was. It’s very difficult to gauge how much you’re earning per hour without tracking your time. Difficult tasks feel like they take longer, and easier tasks feel like they take less time than they do in reality. Having an accurate timesheet is a great tool for communicating the need to raise your rates. Existing clients won’t feel like you’re taking advantage of them if you attach a timesheet that shows your time investment on their project. If you explain that you’re having difficulty making ends meet, and you show them how much effort you’re putting in, they’ll take your request for a raise much more seriously. I’ve really loved working on your project, and I hope we can continue working together. However, I took a close look at my timesheet (attached) and it turns out that I’m barely earning $10/hr on your project. Unfortunately, this isn’t enough to cover my living expenses. On average, I need to earn at least $20/hr to provide an effective service while taking care of my own overhead. I do have new offers that have come in that will provide this level of earnings. While I would prefer to continue working together, I will need to start shifting my attention to other work if we can’t agree on an increased rate. I completely understand that you have fixed costs to cover. If $20/hr isn’t in your budget, I hope we can part as friends. Regardless, I’ll keep taking care of your account for the next 2 weeks. That will give you time to find someone else to take over – and I’ll be happy to get them up to speed. Or, maybe we can continue working together at $20/hr? I hope this is the case! The numbers outlined in the above message are just examples. The end goal is to increase your earnings to a reasonable level, while maintaining your relationships. Caution: It is considered unprofessional to request a rate-increase less than 60 days after starting work on a project – unless the scope of the project has substantially changed, at the client’s request. Be patient, work hard and be honest with your clients. Increasing your earnings, if done correctly, can be a smooth process without conflict. Done incorrectly, you could lose clients and earn negative feedback that tanks your short-term prospects as a freelancer. Working for other business owners and organizations is a great way to start making money quickly. And you’ll definitely gain valuable experience. BUT, you’ll make the most money in the long-term if you can create your own online business – promoting it via Pinterest. Let’s take a closer look at a few ways you can use Pinterest to support your own venture. Did you know that you can make money by promoting other people’s products and services on Pinterest? I started this guide with digging into your personal Pinterest habits and then creating a look-a-like tribe for a specific reason – you can market products to these people. If you love something, your audience might love it too! After you’ve gained a few thousand Pinterest followers, you can start pitching products. And you don’t have to be spammy – in fact, I’d avoid shameless promotion at all costs. You want your followers to love what you share, instead of feeling like a meal ticket. Here are the steps I’ve used to make money from affiliate marketing on Pinterest. You need to sign-up with an affiliate marketing site. 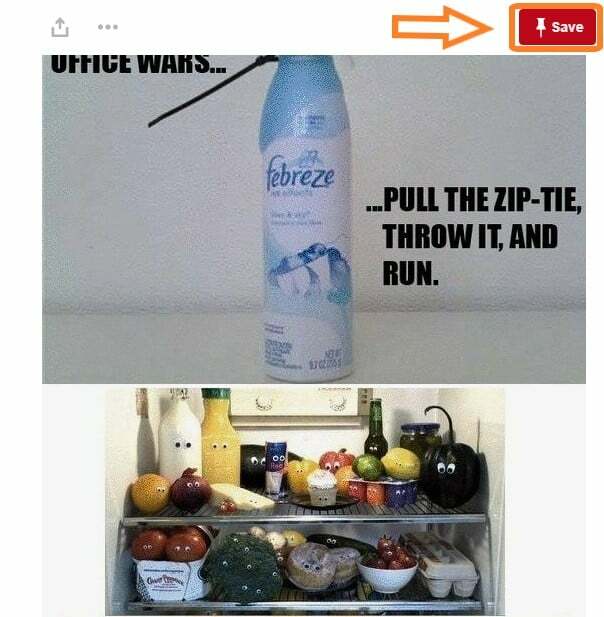 After signing up, you’ll receive unique links to place inside your Pinterest Pins. If a follower clicks on this link, you’ll be compensated for any orders that individual places on the site you sent them to (terms and conditions apply, read carefully when signing up). Note: Most affiliate companies require you to have your own website/blog before accepting you as their affiliate. However, there are plenty of affiliate programs that will accept your Pinterest profile URL. Just check their terms and conditions before applying for their program. Note: I’ve contacted Amazon several times about placing affiliate links inside the pins and I’ve gotten conflicting replies. The first time I was told it was perfectly safe to do it and the second time when I talked to a different person I was told this is against their TOS. The third person told me that it was safe to promote Amazon links on social media as long as I add the social channels to my approved website list and would not directly send them to Amazon, instead send them to the blog first. To be on the safe side, if it’s not 100% clear whether you are allowed to use affiliate links, I wouldn’t do it. It’s not worth it to get your Amazon account banned over this. Also, Amazon requires you to have a blog before applying for their affiliate program. Note: Amazon has reasently wrote a blog post about sharing links on social media. It’s written on March 15th, 2019. These companies pay per sale. Awin used to pay per click as well but not anymore. Awin’s programs are unique to every program. Shopstyle pays per click and the more sales you make, the higher your rate per click will be. I worked about 1-2 hours a week and made $200-$400 a month. Awin uses Rich Pins and has performed way better for me. However, I found Shopstyle more beginner friendly. If you want to make more money, you need to put in way more hours than I did. Awin direct deposits money into your bank account and Shopstyle pays out via PayPal. Before signing up with them, make sure you have a Pinterest account, boards with high quality pins and some followers. They will ask your website’s URL, add your Pinterest profile link as your “website” and you should get approved. It’s easier to get approved with Shopstyle without having your own website, Awin can be more picky about who they approve. Note: It may take you 1-2 months of constant pinning and growing your Pinterest followers before you start earning revenue. Instead of focusing on earning money, create collections of Pins – called Pinterest Boards – that thrill, excite and inform readers with every swipe. Marketing on Pinterest isn’t about a single Pin, but the quality and context of your Board(s). 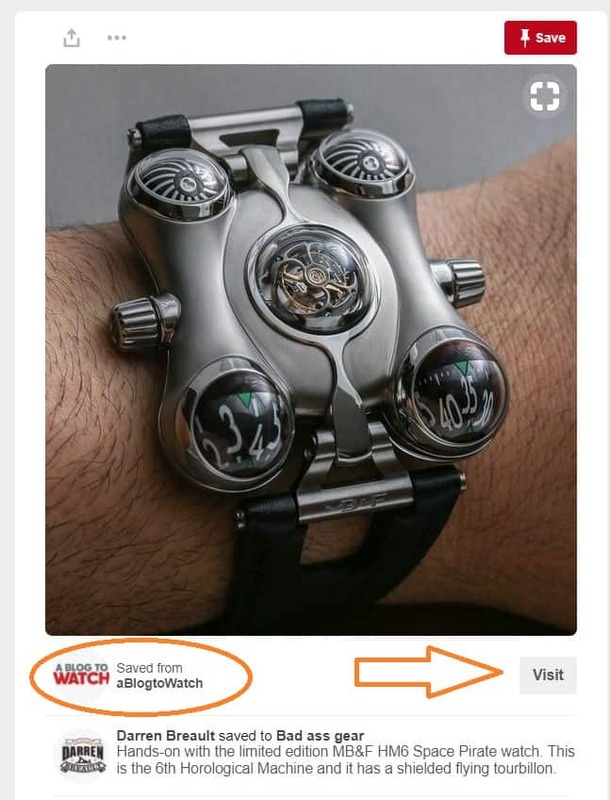 Ashford, in the step above, is an affiliate marketing site that sells high-end watches. You could market for them by creating an entire board dedicated to timeless time pieces – the kind that are striking and memorable. The same people that would be interested in an Ashford watch might also love high-end sports cars and other status symbol items. I would fill the Board with Pins that are aspirational in tone, giving the reader the motivation they need to keep achieving financial success, so that they can afford the finer things in life they crave. It’s important to keep your Board completely relevant to the audience you’re trying to attract. To do this, don’t spam your Board with new affiliate Pins every hour. Only 5% of these Pins should include an affiliate link. The way you insert your affiliate link is very important. The best way to do it is to save a Pin from a blog post you’ve created. You’ll be able to insert a high-resolution photo, and every click will generate traffic to your blog (helping promote your site). Within your blog post, you can place more effective affiliate marketing links (even more than one) in a way that appeals to your most motivated readers. If you send traffic to your own blog, you create a powerful opportunity for visitors to click through other blog posts. If each blog post is informational, interesting and actionable, you’ll create a blog and Pinterest following. A single visitor might click on three or more affiliate links. And that’s how you absolutely crush your ROI from promoting a product or service on Pinterest. And, most importantly, the visitor will feel like you’re a trusted resource for information that improves their lives, instead of a spammy salesman. Note: Most affiliate companies require you to add an affiliate disclosure into your website. Additionally, Pinterest encourages you to mention affiliate links in your pin descriptions. You can simply just add a hashtag at the end of the description (#affiliate). It’s important that you follow affiliate networking rules. You don’t want to get banned from their site. At this stage, you’ve gained experience by helping other brands promote themselves on Pinterest. You’ve also started to generate some passive-income by placing affiliate links into a few of your Pinterest Pins. Now it’s time to earn the most revenue possible from Pinterest, and that’s by promoting your own products. The affiliate marketing in the previous step will only net you a small percentage of the profits that e-commerce sites make when a customer places an order. This step will involve a lot more work – and logistical headaches. Creating products, marketing them, processing transaction and fulfilling orders can be a pain. But, done correctly, you’ll earn more than ever before on Pinterest. At this stage of the game, you’ve become comfortable with posting Pins your audience loves and connects with. The most valuable information you’ve gained is which products sell well. Use your Pinterest analytics to analyze your best performing pins and continue promoting more of these types of pins and products. This decision will be entirely based on your financial resources. If you have over $100,000 in capital, you can create a powerful product line – and absorb the initial losses of developing a new product, and forming partnerships with reliable vendors. If you don’t have a solid startup fund, a single shipment of broken or defective products from an overseas manufacturer could wipe you out. The more conservative approach is to acquire goods from a company at a wholesale rate. This will require some legwork and extra-effort to build relationships with manufacturers, but it’s far less risky than building out your own product line from scratch. There are a number of solid guides on building a product line from scratch, or building a wholesaling business, so I won’t go into too much detail here. Again, this is a topic that has been covered in other guides. But it’s a critical step in creating a platform that can be easily marketed via Pinterest and other social media sites. Build the platform using a site-builder, like Shopify, BigCommerce or WooCommerce. This will minimize the amount of specialized coding – saving you money and time. Take professional, unique photos of your products from multiple angles. Product pictures are the most important part of marketing on Pinterest. If you use someone else’s photos, you could run into issues related to intellectual property rights. Select a domain that’s short and memorable. If it includes a keyword related to your product, that’s a huge bonus. But keep it easy to spell and remember. Stock your site with complimentary products. If the items you sell can be bundled together, you can generate a bigger average basket size. It’s always a good idea to follow the leader in your industry. The Kardashians, though polarizing, are incredibly effective online marketers. Kim Kardashian’s Pinterest has multiple Boards, which she treats as categories for her posts. This way, when she posts a ton of content, only the people that are genuinely interested in the type of content she posts are notified. Someone that’s interested in fashion won’t be overwhelmed with Pins from her about her sisters or kids. I recommend creating a dedicated Pinterest Board for each type of target audience you want to attract to your e-commerce site. The end goal should be to provide a constant flow of entertainment and inspiration – because we all need a momentary distraction from life’s ups and downs. By aligning your products with the passions of your Boards’ followers, you’ll position your brand as a helpful, engaging online presence. In many ways the business account is similar to the personal account. However, with the business account you’ll have access to your Pinterest account’s analytics and it’s free. If you signed up with a personal account, don’t worry. You can easily convert it to the business account. One of the quickest ways to get more followers is to start pinning every day, multiple times a day. Consistency is important because it’s a big factor in Pinterest’s Smart Feed algorithm. Pin at least 10-20 times a day. Pin your own pins and popular content from other people. Try to pin portrait type pins (landscape type pins don’t get as many re-pins and don’t stand out as much). You want your boards to stand out with good visuals. Initial followers are hard to get but when you regularly pin high quality images, you will slowly grow your followers. 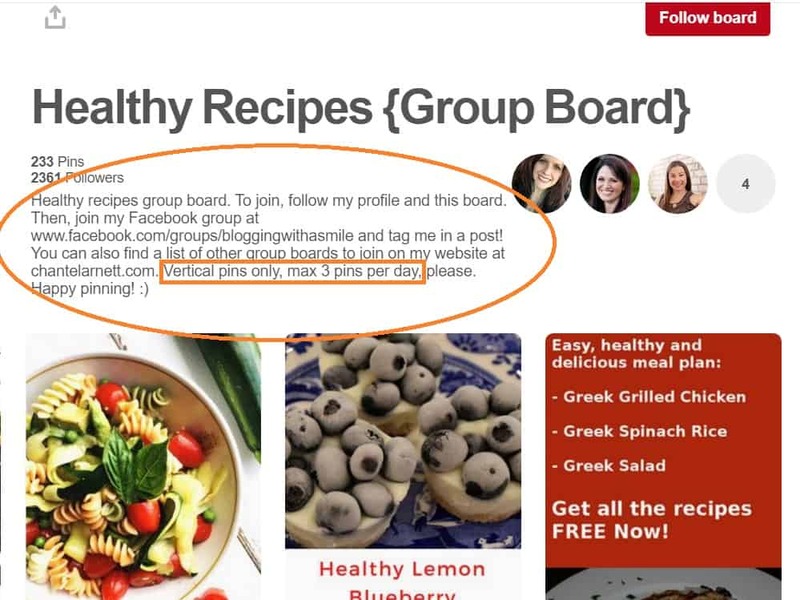 If you really struggle to get your first followers, try to find Pinterest related Facebook groups that offer social media threads where you can post your Pinterest page you want to grow. Depending on the group, you can get like 30-50 extra followers each week you do this. Pinterest can be very powerful tool for driving traffic to your website. For example, I started a new site and just recently connected Pinterest with that site. I only have 467 followers and I consistently get 40,000-50,000 monthly visits to my blog. The easiest way to find other people who are interested in what you pin is to just look at the followers of your competitors. Search for your competitors and go to their “followers” tab and begin following active followers. When you get about 200-300 followers, start applying to Pinterest Group boards. This is the best way to grow your followers quickly and get more traffic to your own blog. More traffic enables you to get more affiliate or Ad network clicks and boost your revenue. You can easily belong to 20-50 group boards. Use Pinterest search function or pingroupie.com to search group boards you are interested in. Or just look up what groups your competitors belong to and apply there too. Additionally, apply for Pinterest Tribes to get more pin exposure and traffic with the help of other bloggers. Note: It’s important to follow the rules of each group board to not get kicked out. This means don’t start excessively pinning and spamming them. Optimize your bio, pins and boards with keywords to get better rankings in Pinterest. Write your keyword in the board description exactly as the name of your board. Additionally, add board covers to make you stand out more and use Canva to make beautiful images. Rich Pins add extra details to your pins and increase re-pins and traffic to your site. A study showed that Rich Pins can add extra 70% of traffic back to your site. Get started with Rich Pins here. Use Tailwind and Boardbooster to schedule your pins to gain more followers. 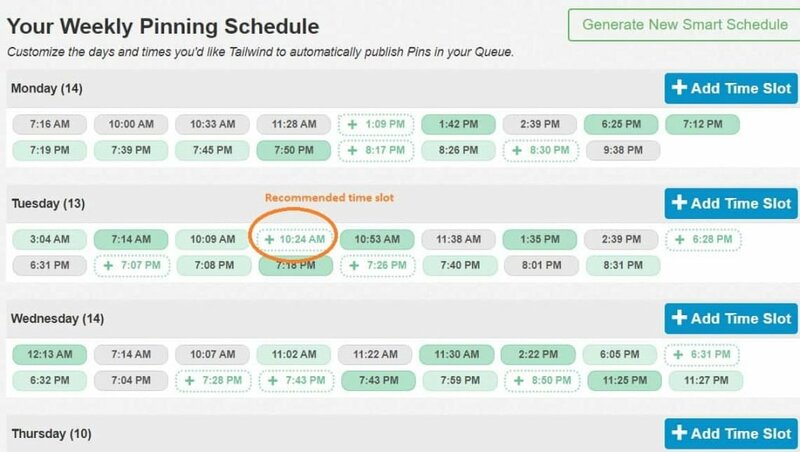 Tailwind lets you schedule any pin easily and in bulk from Pinterest, a blog post, or within Tailwind. It will create a schedule specifically for your audience. It shows you recommended times your audience has been most active with your pins. Tailwind can also shuffle your pins so your newsfeed doesn’t look spammy. Moreover, Tailwind has a great feature called “Board Lists”. With this feature, you can pin one pin to multiple boards at the same time . You can also easily check your analytics in Tailwind, what works best and what doesn’t. Additionally, Tailwind has Tribes feature where bloggers help one another out by re-sharing each other’s pins. Tailwind has added a looping feature after Boadbooster shut down. Start your free Tailwind trial here. Boardbooster is great for looping pins. It takes your old pins from the bottom of a board and re-pins them to the top. It’s best to use it for bigger boards so your looping pins wouldn’t end up with the same pins close together. Note: Boardbooster has been discontinued. They were not in compliance with Pinterest and had to close down on June 28th, 2018. Pinterest has become one of my favorite ways to learn about new things and reach new customers. Because it’s focused on visuals, I can quickly digest new information without having to commit too much of my limited attention span. With enough practice, you’ll learn how to curate Pinterest Boards that speak to unique audiences in an effective way. By directing that audience to engage with a client’s site, or your own site, you’ll build a reputation as an effective online marketer. Do you still have questions about using Pinterest as an effective online marketing platform? I’d love to hear from you. Just drop a comment below. I’m sure your unique experiences will help other people reading this article. Wow! This is a Pinterest course in itself. I like how you laid out the info. I have had similar experiences, only tjat it has not yet converted into huge amounts of blog traffic and sales. However, I see where it is leading, and it looks good! Hi Brian, I’m glad you found my article useful. Yes, Pinterest can be a huge traffic generator. It performs much better for me than Facebook. We really love your blog, awesome job. We are looking for someone to partner with. I have a business proposition for you. I’d like to get in contact with someone responsible for business relations. Thank you for all the information Kat. I’m just a little confused as to how and where you put your URL in an ad or where you put the company’s ad in. I’m just not understanding that part of it. Can you help? Did you mean where to put the url inside your pin? You put the special affiliate link in the destination url of your pin. Oh my gosh! This was so informative! Thank you. Your post answered so many questions that I have. You even answered questions that I didn’t even know I should ask! Thanks again! Thank you.Your article was very informative. Thank you! I recently converted my account to a business account but had no idea what to do with it. This is by far, the best information I have found about doing business on Pinterest! Wow great source of information and tips, thank you for putting this article together. Learnt lots!